Botok is quite popular in Central and East of Java. It’s a mix dish of vegetables and (sometimes) dried fish, coconut meat the wrapped into banana leaves and steamed. Banana leaves are very common to use for wrapping food to steam. They are used in cuisine generally because they are large, flexible, and waterproof. When cooking food with or serving or wrapping food with banana leaves, they may confer an aroma to the food leaves; steaming with banana leaves imparts a subtle sweet flavour to the dish. There are varieties of Botok such as botok tempe, botok tahu, botok daun sembukan, botok daun kemangi, botok lamtoro, botok teri, etc. Today tempe that I made 2 days ago is finally ready. 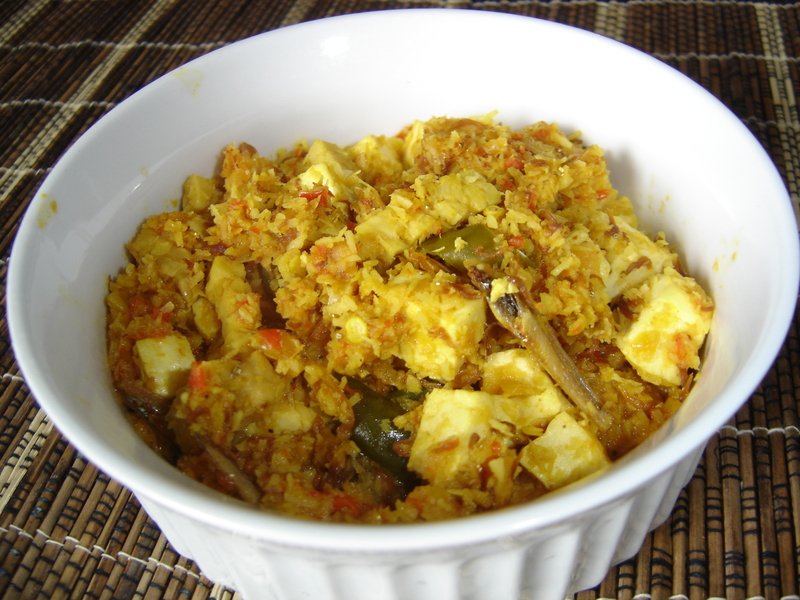 I’m thinking to make botok tempe tahu teri for the lunch. My mother who was born in Jepara, Central of Java likes to make it for us at home. Now that I live miles away from her, I need to cook myself. I sent message through facebook to my sister to ask my mother about the recipe. And turned out is not so complicated. Usually to make botok, we add belimbing wuluh/belimbing sayur (bilimbi in english) and daun kemangi (lemon basil) for better fragrance and the taste. Unfortunately I can’t find those ingredients here. So I have to make botok tempe tahu teri with available ingredients. Because Banana leaves is hard to find here, I used heat resistance ceramic bowl. 1. Grind or blend the spice paste, then sauté it until fragrance. Add, coconut, tofu, tempe, dried anchovies, green chillies, tamarind juice (or belimbing wuluh). Stif fry and mix them well for few minutes. Then remove from the heat. 2. Remove it to the bowl, add lemon basil if you have then steam for about 20 minutes. If you use banana leaves, wrap botok mixture in banana leaf. Scoop about 2-3 tablespoons onto a 10 inch square of banana leaf. Wrap and secure each end with a toothpick. 3. Serve with warm steamed rice.